Lotus Blossom is a Nice and vibrant place located bang on Anjuna Road at Arpora opp. to the petrol station at Tito’s White House. Started by Vikram and Radhika Khanna the pioneers of Thai food in India. Around 17-18 years ago they had started the first standalone (probably in India) Thai restaurant Suko Thai in Hauz Khaz Village, Delhi. Goa also needed an authentic Thai place for long. We reached this place around 8 PM last Friday and it was already bustling with people mostly foreigners. The place has Alfresco seating with ceiling fans which is a little dampener as it’s already 36 degrees in Goa. But I noticed most places are running the same way here. The walls are all painted bluish green with lotus flowers and other flowers painted on them. Simple and elegant furniture adorns the place. The table mats are leaf shaped obviously green, feels as if natural leaves are lying on the table. Coming to our primary driving factor, the Food. Best part is that the Chefs are of Thai origin, which makes the experience worthy enough. We started with a Starters Platter customized for us specially. It had Por Pia (traditional Thai spring rolls), Satay skewers, Peek Kai Thod (chicken winglets stuffed). I loved the wings which were stuffed with glass noodles and a few more ingredients. The dips served were amazing like sweet chilli, peanut sauce etc. 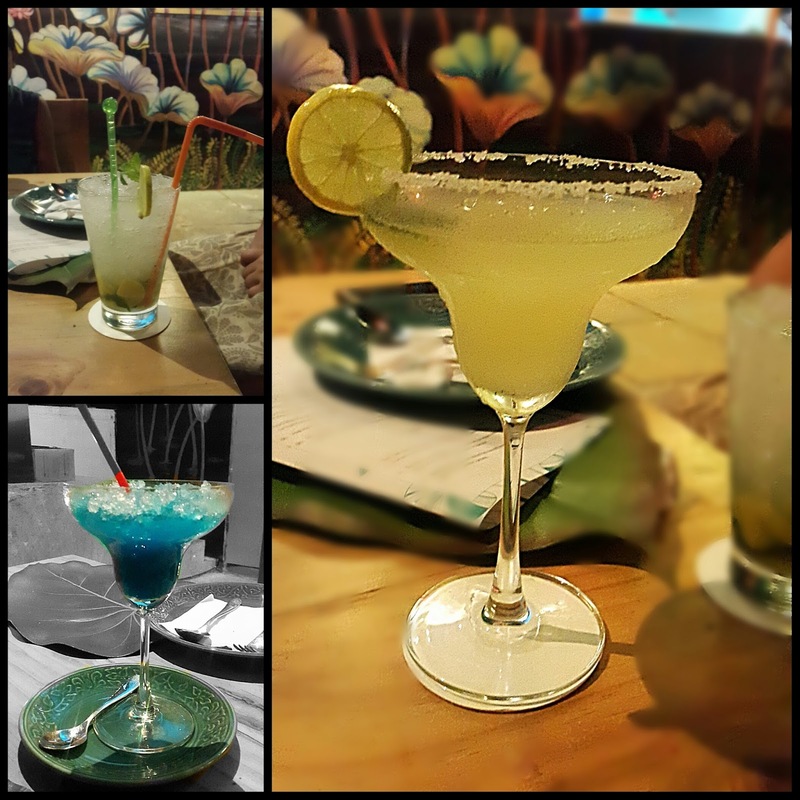 They also have a good range of Cocktails and other drinks on the menu.We tried the Kaffir Lime Margarita which was amazing I can say. I ordered a Tom Yum soup which was very refreshing and tangy with awesome flavor of lemongrass. The best was the Miang Kham (Thai herbs and sauce filled into edible leaves specially betel leaf and eaten like a Paan). The platter was beautiful and really colorful. I also ordered a Som Tam salad (raw papaya salad) for me it was a little more tangy and spicy with no sweet flavor at all. The Yam Neua (sliced beef/buff with mint, shallots, rice crisps and lime juice) was good. We tried the Stir fried chicken with Bok Choy and soya also the Thai green curry veg with rice was amazing. To wrap up our meal we were served with an authentic coconut cream based dessert which, as per my taste was superb. Mildly sweet and chilled with pieces of ice it was awesome. Overall, a nice and colorful place where you can savour good authentic Thai food at reasonable prices made by none other than but only Thai Chefs flown from Thailand.